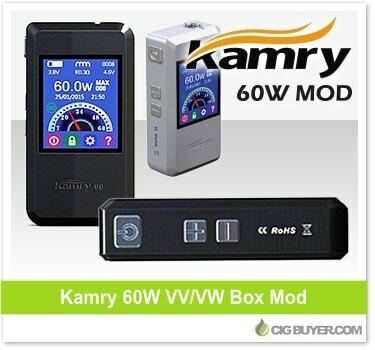 Last week we shared the 30W Kamry Box Mod V2, this week it’s the all new Kamry 60W Box Mod. If you’re looking for power in an attractive, feature filled package, the Kamry 60W certainly looks interesting. The most unique part of the design is the large, color TFT screen on the front of the device, providing you with loads of info at a glance. It has a ton of options and will even record your vaping history if you’d like to keep track. It takes a single 18650 battery, has a removable magentic door, adjustable 510 and will fire down to 0.3 ohm. * No special coupon code is required. Free worldwide shipping applies.